When technology fulfills every dream, reality is a nightmare. Below the streets of New State, the Grounders fight to remain free of the technological control of the world above. When dusk falls, Wren risks her life by entering the capital city as a raider to secure resources for the rebellion. Each step further inside puts her life in jeopardy from New State’s deadliest weapons – Phantoms. More machine than human, tortured until devoid of emotion and caring, Phantoms have only one objective. Kill. And they do it with exacting precision. 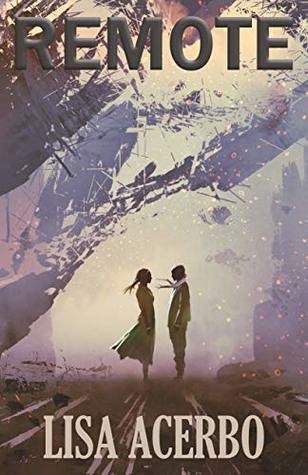 Wren is good at her job as a raider and committed to the cause until she meets Codex, a New State citizen who doesn’t quite fit her preconceived expectations. After a couple of awkward encounters, he shows her the meaning of hooking up—a computer simulation that allows people to live out their fantasies—without the complication of emotional entanglements or physical reality. But what Wren feels for Codex is very real. And it’s punishable by death. “We should stop.” Part of her didn’t want to. Codey ignored her words, pulling her closer. Wren should draw back, take a breath, but her body betrayed her and she wrapped her arms around him tightly, tangling her fingers in his hair when their lips met. She kissed him back. She felt his hand run over her thigh and then move up. He slid his fingers under the fabric of her worn sweater so he could caress her abdomen, tracing the lines of her ribs. In the next second, he whipped off his shirt and pulled her close, continuing to kiss her. She felt his skin, smooth and hot, and thought she would scream if she couldn’t get closer to him. She pushed herself against him, and Codey responded with another passionate kiss as he pressed gently against her on the bed. “Welcome to reality.” She smiled at him. “I’m not sure I like it.” He adjusted his clothes. He acquiesced, grabbing an old six-inch tablet. She shoved it into her pack as Codey began to lead her out the door. Codey stopped her in the doorframe of his room. “Not until I get a“We should stop.” Part of her didn’t want to. She should draw back, take a breath, but her body betrayed her and she wrapped her arms around him tightly, tangling her fingers in his hair when their lips met. She kissed him back. She felt his hand run over her thigh and then move up. He slid his fingers under the fabric of her worn sweater so he could caress her abdomen, tracing the lines of her ribs. In the next second, he whipped off his shirt and pulled her close, continuing to kiss her. She felt his skin, smooth and hot and thought she would scream if she couldn’t get closer to him. She pushed herself against him, and Codey responded with another passionate kiss as he pressed gently against her on the bed. “Not until I get another kiss.” His voice was husky and human, his smile unabashed. Once downstairs in the laundry room, Codey shoved some of his mom’s clothes into a small duffle and handed it to Wren. “What do you need these for?” he asked. Wren didn’t know how much to reveal. She had to leave and return to the rest of the raiders soon or they’d trigger the alarm to search for her. She lacked the time to explain properly and hated to leave Codey guessing about the Grounders and the archive raid. “It’s part of the plan being developed,” she said. “I’m so sorry, but I have to go. You’ll understand soon.” Wren hoped she survived so she could come back and explain. 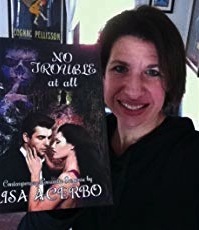 Lisa Acerbo is a high school teacher and adjunct faculty at the University of Phoenix. She lives in Connecticut with her husband, daughters, two dogs, and horse. When not writing, she mountain bikes, hikes, and tries to pursue some type of further education.